“A life changing, golden opportunity.” - Earn up to £1,650 a week! Running for over ten years our hands on Training Days have been designed to teach you everything you need to know about setting up an external business, offering services including patio and paving cleaning, external gutter cleaning and professional window cleaning. With extensive firsthand experience in the cleaning industry, we pride ourselves on providing thorough and authentic training, which meets the needs of customers whether starting a business from scratch or seeking an additional profitable revenue stream. Our upcoming training sessions for 2018 are listed below, click 'register now' to book onto one of our upcoming days. No! Our training days are open to anyone who’s interested in starting their own external cleaning business – all you need is motivation, dedication and a desire to learn. We’ll teach you everything you need to know, including practical and business skills, as well as tricks of the trade. Absolutely! Our sessions tend to fill up quickly so make sure you book early to avoid disappointment. Register your interest today and we’ll keep you up to date and let you know when new sessions are released. What's included in a Typical Training Day? Starting at 10am, we’ll kick off the event with a meet and greet, followed by a discussion on marketing, pricing, and profits. We’ll cover topics such as knowing your market place, promoting your business, performing a site survey, and pricing a job. 12:00: A chance to refuel, network, and reflect on your morning. Lunch and refreshments will be provided. Practical demonstrations, tips and tricks of the trade and hands-on use of the SkyVac Gutter Cleaning System, Paving Cleaning and Sealing, Window Cleaning and the Wheelie Bin Washing System. 3:30pm: Reflecting on the day’s learning, we’ll be on hand to answer any questions or queries you might have. We'll also be handing out a Spinaclean Goodie Bag before you leave! Our demonstrations are held at the Spinaclean head office, just off J15 of the M1, Northampton. The address with postcode is listed below with a map on the left. 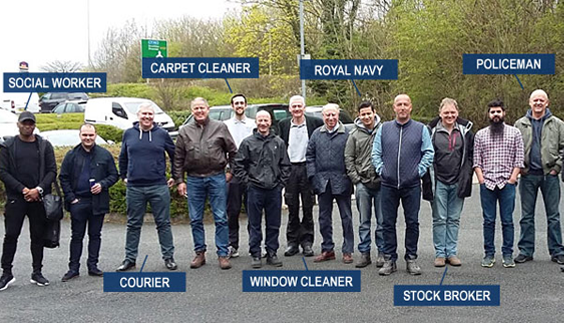 With over 40 years' experience behind us, we have the knowledge, skills, and experience needed to start and successfully run an external cleaning business. Our training days have been designed to teach you everything you need to know about setting up an external business, offering services such as patio and paving cleaning, external gutter cleaning and internal vacuuming, and UPVC cleaning projects. Know your market place and how to promote your business. How to perform a site survey and price a job. Preparation of quotations and how to close a sale. You can come along and learn about all, or just a few of the services above. Hands on demonstration of how to use the professional paving cleaning equipment safely and efficiently with all the required attachments. Why seal, what are the benefits? A great addition to your external cleaning business is the SkyVac which cleans gutters from the safety of the ground and will ensure that you will be kept busy throughout the year. Methodology of the cleaning gutters using SkyVac, including the bullet inspection camera with monitor. With potential of earnings of £2,625 per week, our mobile wheelie bin cleaning system is the perfect start-up business opportunity or as an add-on to an existing business. Just wanted to drop you a quick line to say thank you for the training day last Friday. I'm very excited about starting my new business - the day enthused me further and gave me so many snippets of information that I feel much more confident about my venture. I will be taking advantage of the offers given on Friday, most likely taking the silver package. Again, thank you for the day, it was delivered professionally and in a relaxed and friendly manner which I enjoy immensely. Massive thanks to the guys at Spinaclean and to both Paul and Steve for a well thought out and presented training day. I attended the training day on Friday 21st October and was not left disappointed. To anybody starting out in this industry then this course is a must. You will receive expert advice and knowledge covering topics such as quoting jobs, health and safety, marketing and promoting your business right through to handling all aspects of the wide range of products Spinaclean offer. One thing I will say is that never at any one time did I feel that this was a sales pitch. Although I did invest in the Gold package along with several accessories I was only ever informed of the products and had my many questions answered. I have since had several phone calls and emails from the team and have also had a few products thrown in to my purchase as a good will gesture to get me on my way. I left the course motivated and confident that my business could work and felt ready to take the plunge. I got everything I hoped to from this day plus much much more.